Have a good day. Thanks for sharing. You have certainly outdid yourself this time...this card is amazing! Kendra who ever you are making them for is super lucky!!! They are stunning, your art work constantly blows my mind!!! This card is lovely. How are you going to do the inside? That invitation is very ELEGANT - GORGEOUS is more like it! I love how elegant this is!! It is perfect!! 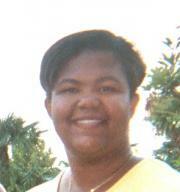 TFS Kendra! The picture of your card came up on the screen and I went, "WOW!!!" That is one stunning invitation!!! The bride or whoever the party is being held for must be thrilled to pieces about the great job you did with them. OMG! 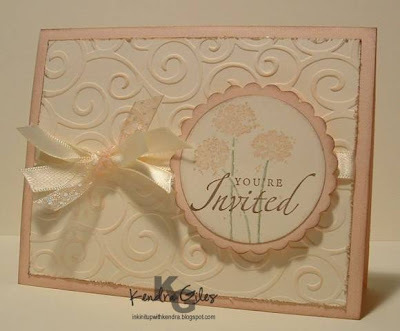 Kendra....these invitations are awesome...your creations are so beautiful. This card is so elegant and I love the colors. Thanks so much for sharing! Love, love, love this card!!! Simply elegant! Thanks for the cuttlebug folder ideas. I need to get busy! Beautiful card, Kendra, I'm sure the bride loved it! OMG! Kendra, I just have to ask you, you've inspired me to case your layout for my daughter's 1st communion invitation. I've been wanting to use my gold cs & cross stamp set, but haven't been inspired until I saw your card this morning. If you have any suggestions, I'd be all ears & eyes. Very soft and pretty! Love your invitation Kendra. YOU GO GIRL!!!! This is absolutely gorgeous!! You're right, the blush blossom and mellow moss are the perfect combination!! I'm having a SAS this week-end, and, if you don't, mind, I'd love to case this one and include it!! I will change it up a bit as to occasion. You are so very talented!!! Very beautiful! Great card. You are right it is very elegant. I have had people ask me to make cards but I never know what to charge. I'd like to talk to you about it. You can vist my blog and or email me if you feel comfortable discussing it. Hope your week has been great. What a beautiful card! I just found your blog and I am loving it! Gorgeous card! Have fun doing that many. Really enjoy your blog. you are so fabulous. I have been caseing your cards from splitcoast for sometime now and finally decided to follow your link. I am so glad I did. thanks so much for the inspiration. this card came at jus the right time I was asked to make some bridal shower invites and found yours right away, needless to say I cased it immediatley and can't wait to get this order. Thanks again. You are Fa-bo-lo-us!!! So pretty and elegant! Perfect wedding invitation....I'm sure they were a huge hit!